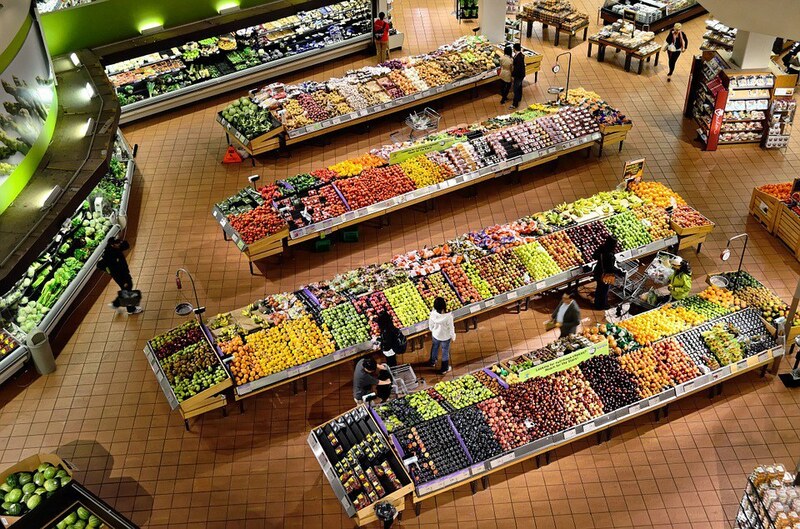 The futuristic shopping method may come with a variety of issues. Last Monday, Amazon delivered the news of plans for an enhanced grocery shopping center that could be the future of retail. With no check-out kiosks and no lines, they hope to create a better and faster experience for all. Through deep learning algorithms, computer vision and sensor fusion (something Amazon calls "Just Walk Out" technology) customers will be able to enter the store and check-in with their smartphone. From there, you grab what you need and walk out. The store will charge your Amazon account for the items and send you a receipt with no wait. Amazon is currently testing out their new 1,800 square foot shopping facility on Amazon employees in Seattle, Washington, and if all goes well, it will open to the public in early 2017. You can watch a video and check out the FAQs on the Amazon website here. While I think this has potential, there are quite a few aspects that Amazon is staying eerily quiet about, including how exactly they are going to pull it off. Ignoring the hype, I can only think about the potential problems for this futuristic concept. How does it work? In March 2015, Recode posted an article about a patent application filed by Amazon that outlined some of the ideas that would make the new store run smoothly. The article suggests we may have a reason to be concerned about our privacy with this system. They say, "the application describes the use of cameras that would snap photos to show, for example, when a person entered the facility, when she removed something from a shelf and when she left with an item in her hand. There is mention of facial recognition... User information may include, but is not limited to, user-identifying information (e.g., images of the user, height of the user, weight of the user), a user name and password, user biometrics, purchase history, payment instrument information (e.g., credit card, debit card, check card), purchase limits, and the like.” This is the same idea as an employee following you around the entire store, watching what you pick up, and writing it down, but through cameras, computers and technology we don't understand. Another theory introduces the use of RFID, or Radio Frequency Identification, which lets retailers identify products just like bar codes do, but through a wireless network. With the little information we have on the technology, Amazon claims it's similar to the specifics of self-driving cars. But the problems don't end with the potential privacy invasions. The gist of Amazon's store has what we know as "shoplifting" as their selling point. How easy will it be to enter the store and just not scan your smartphone, essentially keeping yourself out of the system altogether? What about the individuals who don't have smartphones? No smartphone, no sale. 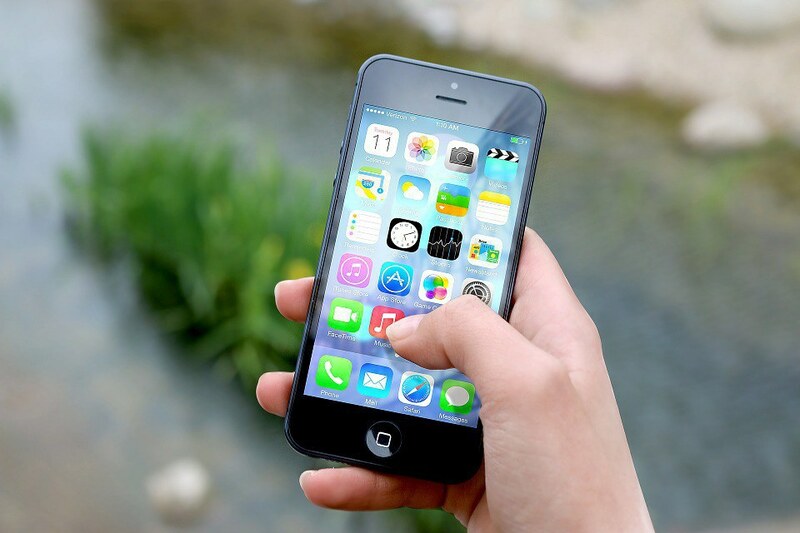 And something that happens to many as a regular occurrence--what if your phone dies while you're shopping? How will groceries be bagged, if at all? How will they handle a return policy? Picture this. Amazon Go opens up to the public and a father and his two young daughters decide to go shopping. The girls are tossing into the cart--this snack and that snack--while Dad shops, too. A perfectly logical and realistic situation. If a human being watching diligently behind a camera isn't involved, how will Amazon track multiple people putting multiple items in a cart? Do each of the daughters need a smartphone and Amazon account or can they somehow be "linked" to the main account? How will this technology know the girls belong to the father in the first place? There are many unanswered questions about the specifics of Amazon Go. For now, all we can do is watch and wait for more information. AB's low-blow at JuJu has put a target on his back for the impending 2019 season. 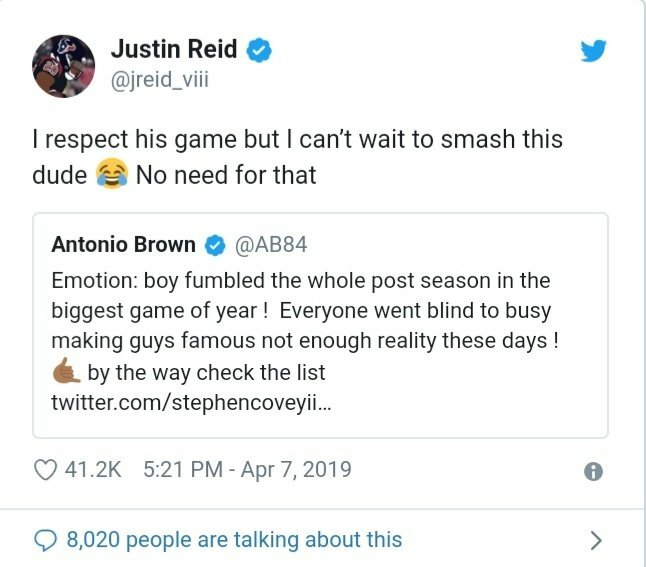 Recently, Raiders wide-receiver Antonio Brown initiated a Twitter "war" after Steelers wide-receiver JuJu Smith-Schuster was named MVP for the 2018 season. Brown retaliated with a response to a tweet shared by a fan that sparked a fire and brought emotions to an all time high within the NFL fan base. 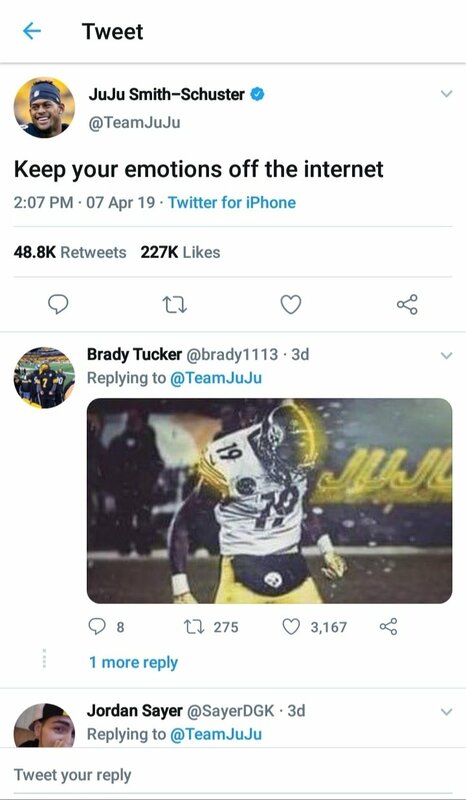 All of which took place after the former wide-receiver for Pittsburgh previously tweeted "Keep your emotions off the internet" just hours earlier, acting as if he is the herald of good advice. Ever since then AB has been nothing but emotional, even taking down a former teammate in the process. We've all been exposed to AB's attitude since he was drafted to the Pittsburgh Steelers in 2010, but it's gotten worse over time. Still, Pittsburgh fans disregarded his actions for a while because of his skills on the field and million dollar smile. His charm and endless pictures of his children always, if not most of the time, managed to get the fans of Steeler Nation to turn a blind eye to his mischievous ways- at least until the past few seasons. It seemed that his attitude had gotten worse, along with his sense of entitlement and spreading of hate and jealousy toward his fellow players. His attitude and purposeful actions eventually granted his wish of being traded from the Steelers, ending up as the Raiders' new wide-receiver. 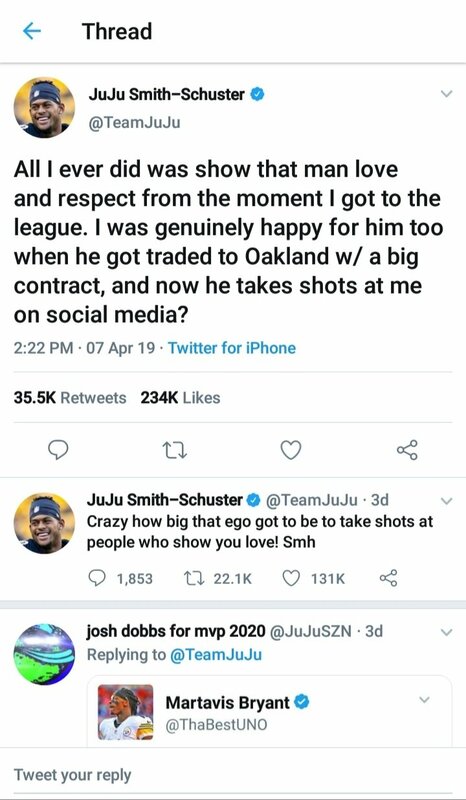 Ever since the trade, his ruthless attitude and ongoing hypocrisy continues to ascend to greater levels than before, after JuJu fired back at Antonio with a dose of his own medicine. Immediately following, JuJu expressed the betrayal and disrespect he received, regardless of the fact that he practically idolized AB since he got drafted in 2017. 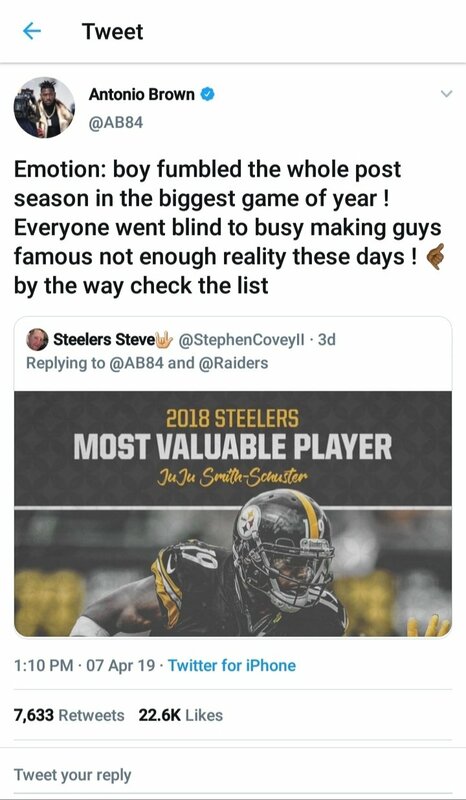 The rookie MVP called out the Pittsburgh veteran for the size of his ego and ability to fire shots at people that adored him. If anything, this debacle was an enlightening event for the young WR and is now aware of what kind of person his former idol is. 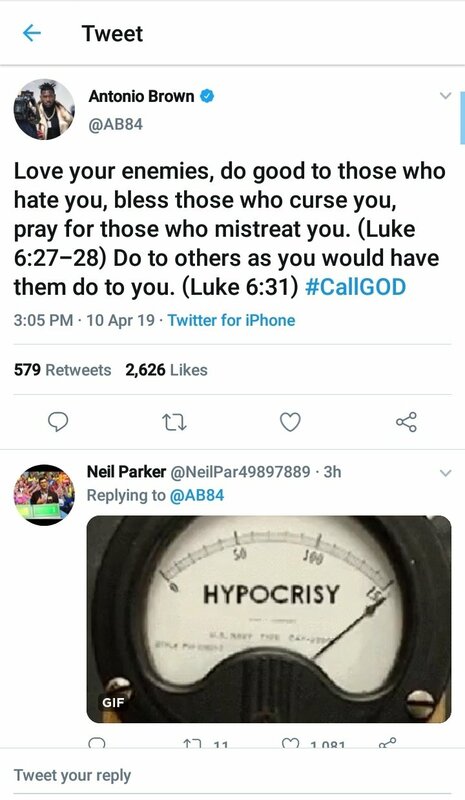 Following this, AB decided to take advantage of one of his known slogans #CallGod a few days after the fact. Instead of continuing his antagonizing behavior, he decided to quote the Bible as if it would excuse his initial shot toward JuJu. In doing so, he decided to carefully pick verses from Luke 6 in order to fit his own egotistical agenda. "But love your enemies, do good, and lend, expecting nothing in return." Luke 6:35, a verse that is visibly ignored to avoid contradictions for his recent actions. As we can see in the tweet thread, fans are recognizing the hypocrisy that Antonio Brown is proudly exuding and are emphasizing it. AB's repugnant attitude and "preaching" has pushed fans to see that Brown will betray anyone who attempts to take his spotlight, regardless of him making the same mistakes in past seasons. The once-beloved, former Pittsburgh WR is ready and willing to place blame on fellow teammates but will very rarely take blame for his own faults. Because of this trait and actions that have followed, Brown now has a target on his back for the 2019 season. The NFC is ready to avenge JuJu Smith-Schuster and I don't believe Antonio realizes what he's gotten himself into. It's no secret that Brown has quick feet and can run across the field with great speed and agility, but people always find a way when rage drives them. It seems as if JuJu has great support across the entirety of the NFL, regardless of rivalries that exist. Let's remember: Antonio Brown was in his prime with the Pittsburgh Steelers. The Raiders are getting the aftermath that won't last much longer. It wouldn't surprise me if the Raiders make arrangements for someone to buy-out his three-year contract if his attitude doesn't improve. No team, no coach, will tolerate Antonio longer than Coach Tomlin did. Regardless, AB better start taking his "Call God" slogan seriously because he might need the Big-Man soon if he continues his disgusting and childish shenanigans.